The quantities estimates of the previous chapter are based upon the theoretical rebar lengths as provided by the software. Since the reinforcement bars have specific lengths, usually 12 ή 14 m,ordering them with their exact lengths will lead to the formation of oddments i.e. short re-bars of length e.g. 0.80 m, which cannot be used. Every reinforcement supplier has his own me-thod to manage these oddments in order to minimize the cost and , at the same time, offer con-structional accuracy. The methods followed in order to manage the issues of oddments and constructional accuracy are generally referred to as optimization. The persons responsible for the reinforcement’s optimization can be either the designer engineer in charge of the detailing or the quantity surveyors of the reinforcement supplier. The following paragraphs present generally the issue of optimization together with a proposition. In every case, no matter which optimization method is being followed, the estimates [*] NoteThe theoretical mass of the rebars mentioned in table 1 (e.g. for Ø20, 2.47 kg/m) usually in practice, has a deviation that ranges from +1% to +2%. of the bars number used in the reinforcement implementation must mention the percentage of rebar losses [*] NoteThe loss percentage is a relative quantity and is completely independent of the actual mass. It varies from +1% to +6%, according to the optimization method followed by each reinforcement supplier. . This happens because the reinforcement cost estimation [*] NoteThe most simple and practical way to include the reinforcement in a bid and to estimate its cost, is by setting the price based upon the actual mass of the properly shaped and ready-to-implement reinforcement, having calculated the losses as well. Each total amount will be defined by measuring the reinforcement’s weight. must include these losses as well. 2nd) Based upon the dimensions of the drawings and the theoretical anchorage and lap-splice lengths, he/she defines the theoretical rebar lengths. However, in the construction, the dimensions of the real formworks present an unintended ‘con-structional deviation’; as a result, cutting rebars to their theoretical lengths is economically chal-lenging and creates a large amount of oddments. The unavoidable constructional deviation depends upon the tools, the experience and the dili-gence of the contractor responsible for the formworks’ implementation. This deviation is consid-ered to be in the order of 10 up to 30 mm. Moreover, the rebars’ cut to random lengths is productive only in the case of coil-cutting ma-chines but even in these cases the coil usually covers rebars with a diameter up to Ø12, or Ø14. 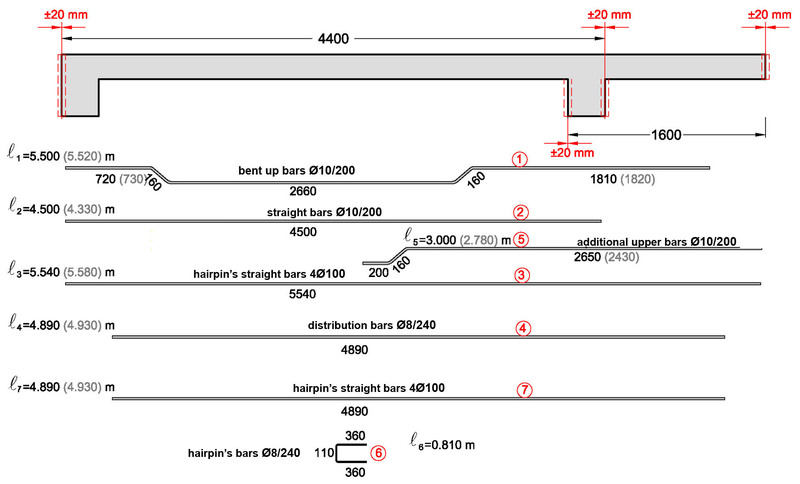 In all other cases, the rebar must be cut to supplementary amounts of industrial bars with usual lengths equal to 12 or 14 m. In order for this to be feasible, and always to a certain degree, the available rebar oddments must be separated according to their diameter and length which from a practical point of view, is a complex and space/labor demanding procedure. Finally, there will always be rebar losses. A large amount of losses includes an increased mate-rial cost and a lower labor cost while a small amount of losses corresponds to a larger labor cost. The targeted goal is the optimum combination that leads to an economical solution where the minimum rebars length requirements are obligatorily met. An effective optimization method which provides an effective combination of cost-losses is the method of the ‘standardized cut and storage’ in which the rebars have length of a specific step equal to e.g. 250 mm [*] NoteThe standardized cut and storage offers many advantages to the organized reinforcement suppliers. The two major advantages are: a) The rebars’ cut and storage as well as the gathering of the rebars requested by an order, are separate tasks performed by different person-nel.b) at all times, the supplier may know the exact number of every specific length-rebar requested by e.g. the daily orders, and therefore he can manage his stock. The ‘standardized cut and storage’ entails losses in the order of +2%. The following paragraphs examine 3 optimization examples regarding the rebars of specific structural elements, based upon the following assumptions: (a) constructional deviation= 20 mm and (b) standardized cut with a step equal to = 0.25 m.
In the example of the one-way slab in §3.5.1 the total slab length was 4.40 m and the length of the lower rebars was 4.33 m.
In both ends of the slab, the side formwork might slip to the left or to the right around 20 mm therefore, in the two worst cases, the slab’s span length may take a value between 4.40-0.02-0.02=4.36 m and 4.40+0.02+0.02=4.44 m. Rebars are critically affected when the slipping of the slab’s ends happens towards the inside. 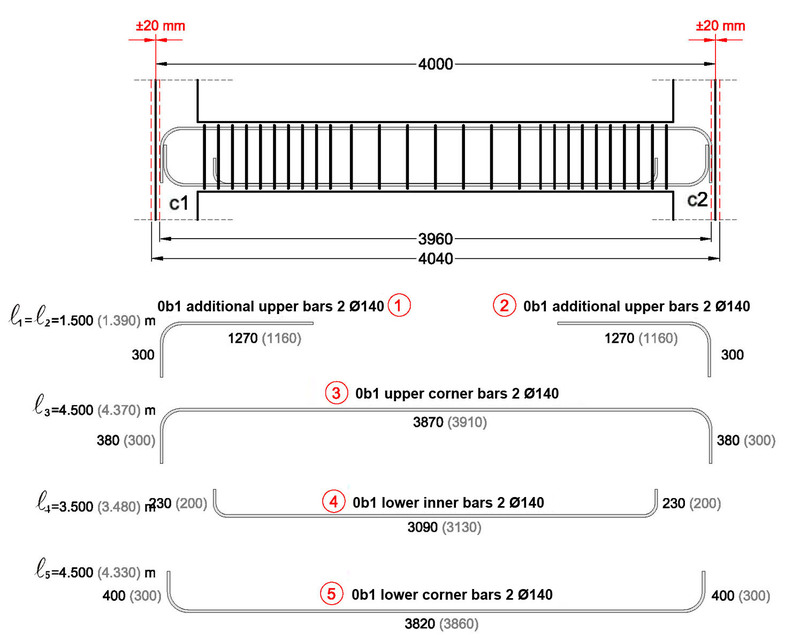 In order to avoid such a case and have the proper cov-er depth, the lower rebars must be formed with a length equal to 4.33-0.02-0.02=4.29 m.
The standardized cut length is 4.25 m or 4.50 m. In this case, it is not possible to cut the rebar to a length either shorter (than 4.25 m) or longer (than 4.50 m) and therefore the optimization regards only the constructional deviation. Consequently, the rebars (2) must be cut to a length of l2=4.29 m instead of 4.33 m. The same thing applies and to rebars (5) which will be cut to a length equal to l5=4.29 m rather than 4.33 m.
By an analogous way of thinking, we concluded that the rebars (1) will have a cut-length of l1=4.38 m instead of 4.42 m. The length difference is divided in the upper horizontal parts of the bent-up rebars which will be formed with a length equal to 0.71 m rather than 0.73 m.
The hairpin rebars (4) have a short length and there is no reason for cut optimization. The rebars (3) will have a cut-length of l3=4.89 m rather than 4.93 m.
In the example of the simply supported slab connected with a cantilever slab mentioned in §3.5.3, the total length of the first slab was 4.40 m and of the second slab was 1.60 m. Accord-ing to the previous example the total lengths of those two slabs may range between 4.36 and 4.44 for the first slab and between 1.56 and 1.64 for the second slab. The constructional deviation of the two slabs does not affect the majority of the rebars’ lengths because it is possible for the latter to move to the adjacent slabs. Rebars (3) are the only ones that have limitation and since they do not have a margin either to the left or to the right, they must be formed with a length equal of 5.54 m instead of 5.58 m. For the same reason the verti-cal bars (4) and (7) must be formed with a length equal to 4.89 m rather than 4.93 m.
The rebars(1) must have a length of 5.50 m instead of 5.52 m due to a minor difference (where the left upper horizontal part of the bent-up rebar becomes 0.72 m instead of 0.73 m and the right upper horizontal part becomes 0.181 m instead of 0.182 m). 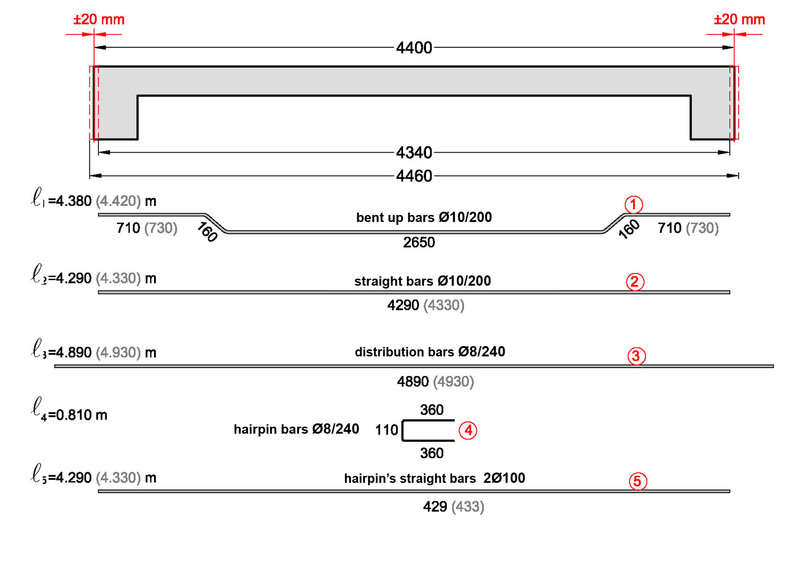 The rebars (2) will be formed with a length equal to 4.50 rather than 4.33. The rest of the rebars have a limitation and cannot be standardized therefore, the bars (4) and (7) will be formed with a length equal to 4.89 rather than 4.93. In the example of the simply supported beam in § 3.4.1 the beam is 4.00 m long and therefore, the total length may vary between 3.96 m and 4.04 m. The constructional deviation does not affect the support rebars (1) and (2), which will be formed with a total length equal to 1.50 m in-stead of 1.39 (where the last length will become 1.27 rather than 1.16). The lower and upper rebars of the beam are affected by the constructional deviation. This is the reason why the bars length must be shortened by 40 mm, however, the hooks may become lar-ger so as to achieve the required final length (hooks must not extend outside the concrete’s mass and inside the beam’s cover depth). The rebars (3) will have a total length of 4.50 m instead of 4.37, with a span length equal to 3.87 rather than 3.91 and their hooks will be 0.38 long instead of 0.30. Consequently the reinforcement bars (4) will have a total length equal to 3.50 m rather than 3.48, with span length 3.09 instead of 3.13 and their hooks will be 0.23 long rather than 0.20. The rebars (5) will have a total length of 4.50 m instead of 4.33, with span length equal to 3.82 rather than 3.86 and their hooks will be 0.40 long instead of 0.30.